SeaGlass snack for a gift to your friend!? The other day my wife found this snack called SeaGlass on the advertisement leaflet. “The idea was from the sea glass on the beach in Izu. The texture is pretty unique and you would love it once you try it!” This phrase tempted us out to the tradeshow that the snack maker YuuYuuAn participated in. SeaGlass is a jellylike snack with thin sugar coating around. 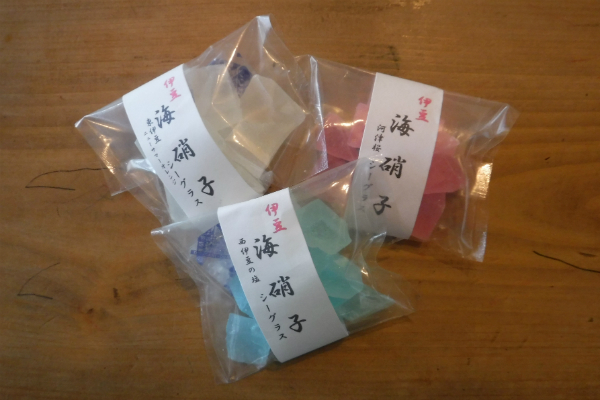 NewSummerOrange, KawazuSakura, and Salt flavor is available and it is 150 yen each. It was so sweet and yammy, and we ended up purchasing them all. We had a good talk with the owner at YuuYuuAn, and hopefully they can become part of BeachMoney in the near future!